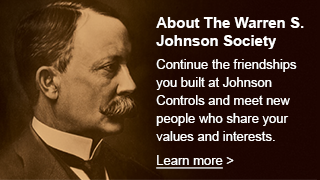 Welcome to WSJSociety.com, the new Warren S. Johnson Society website. With your participation, we want to make this site more than a source of information. We want to build a community that enriches our lives and the lives of others. In my 40 years at Johnson Controls, the company was not only a source of financial support for my family and me, but also a place where I built relationships, working with other employees to advance the company’s mission. We want this website to help continue such relationships, connect people with like interests and offer opportunities to serve others. The first step is for current WSJ Society members to register for website access. We’re also encouraging eligible people who are not yet members to join the society. In the months ahead, we envision members communicating with each other, forming groups, exchanging information and ultimately getting together for activities, hobbies, volunteer work or helping each other. Privacy and security are built into the site. We don’t share the personal information you provide when you register. And you decide what information to share with other members. We are grateful to Steve Roell and Alex Molinaroli, who proposed and made available company resources to improve society communication and participation. Kim Metcalf-Kupres and Karen Sommer have led the Johnson Controls team and our website designers, McDill Design. Jude Anders, Greg Pascucci and I have provided society input. But this project’s success resides with you, our members. Please explore the site, consider how you’d like to participate and contact us with your likes, dislikes and suggestions for improvement.